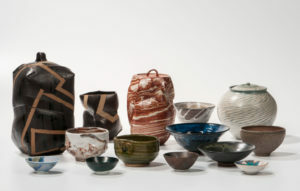 The Aesthetics of Function: The Influence of the Japanese Tea Ceremony in Modern American Studio Ceramics | Skinner Inc. When the centuries old Japanese tea ceremony crosses national and international boundaries not only does it deposit forms and aesthetics in these new cultural territories, but it also borrows from them, enriching the aesthetic vocabulary of utensils intended for, or adapted for, use in the tea ceremony. Since the opening of Japan to the West in the mid- 19th Century, ceramicists, scholars, and collectors have been magnetized by the richness of Japanese ceramic culture. Innumerable American potters have studied in Japan with master potters, and an increasing number of Japanese potters have taught in America. 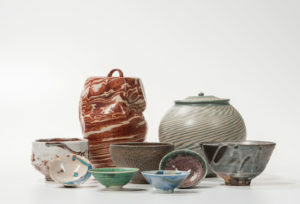 Japanese terms for glazes, as well as techniques for forming and firing are now common in American ceramic studios. It would be impossible to engage in the study of Japanese ceramics without being confronted with the single most famous of all Japanese ceramics – the tea bowl—and the challenge (for foreign potters as well as contemporary Japanese potters) is to “demystify” it. However, the practice of Chanoyu (the Tea Ceremony) requires many different ceramic forms, including containers for the powdered tea (matcha), fresh water, food, incense, charcoal and ash—each requiring specific attention to use as well as to reference to the changing seasons. When planning a gathering for a tea, the Chajin (Tea Person) spends considerable time planning the Toriawase for the event which means the orchestration of forms, materials, colors, textures to give the guests a uniquely satisfying aesthetic experience. On June 20th, an introductory program led by William Thrasher will focus on various ceramic utensils made for, or adapted for, use in the tea ceremony which have been created by American ceramicists. Join us for the reception at 5:30PM and lecture at 6:00 PM at the Boston Gallery. William Thrasher is an independent curator in contemporary Japanese art and crafts, and has lived and pursued research in Japan both as a Fulbright Scholar and a Japan Foundation Research Fellow. He has been a student of the Japanese tea ceremony for almost 40 years and has been designated a Tea Master by Sen Soshitsu, the Grand Master of the Urasenke Tea Ceremony. This entry was posted in Blog, Event and tagged 20th Century Design, antique event, art event in Boston, Boston lecture, fine art event, free event, Japanese art by Skinner. Bookmark the permalink.